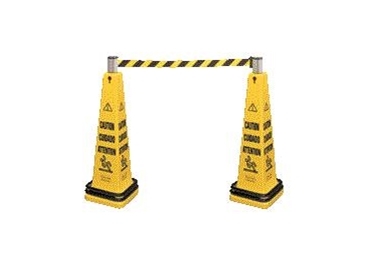 Safety Barriers and cones, available from Total Lifting Solutions maintain seperation between scissor platforms and pedestrians, especially when the scissor platforms are recessing below ground level. Audiable alarms are an advantage to advise operators when something or someone is in the range of the platform. The Rubbermaid Mobile Barriers are easy to use, easy to see, easy to move and easy to store. They are flexible and can be set straight, curved or in a circle. With 16 articulating panels they are 4m long and have two 10cm non-marking wheels and four locking straps to secure barrier in closed position. The Rubbermaid Safety Cones are highly visible, bright yellow hazard protection systems. The versatile top design accommodate barricade belts and audio guards. The molded in slots allow for easy handling. The Rubbermaid Audio Guard warning mechanism is a motion triggered audio warning and flashing light. It warns pedestrians with your own recorded 12 second message or plays one of six pre-programmed messages and the volume is adjustable. It locks securely on top of Rubbermaid safety cones. Reduce the cost of back injuries in your plant and bring down the cost of your Workers Compensation Insurance - and bring up your bottom line. Indexing Function: During loading the pallet can be programmed to drop a preset distance when another layer is loaded. Safety Bar Alarm: Sounds when the table comes into contact with an object or person. This provides added safety by alerting others nearby that there is a potential problem. Cycle Counter: Lets you know when a service is programmed. This improves the SMARTLIFT’s working life & avoids breakdowns.